First, what is a PixFort project? PixFort platform allows you to create projects in your account based on how many licenses you have. In each project you will be able to create and organize multiple pages using PixFort builder to create multiple landing pages, website...etc. 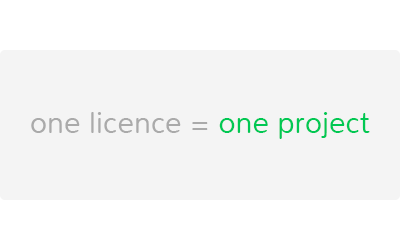 How many projects I can create per license? To make it simple, for each regular license you purchase from themeforest you can create one project in PixFort platform, so if you purchased 2 licenses of a template from themeforest you will be able to create 2 projects using that template. Note: in each project you will be able to create multiple pages and the project could be used as long as you use it for the same end product. Example: if you want to build multiple landing pages for your company or client, one regular license will be sufficient, however, each license can be used on a single domain (subdomains are included as long as they belong to the same End Product). You can create one project with multiple pages (i.e. landing pages, website with multiple pages, one page website... etc). You will be able to download all your project's source files (HTML) anytime you want without any extra fees. You have access to all integrations (including FTP publish) without any extra fees. And you get awesome support from our friendly team! Note: when you purchase more than one license you just need to re-synchronize your account with Envato Market to verify your new license, to do this just go to your Account Settings page and click on the green synchronization icon. Please verify that the template you purchase is made for PixFort platform, currently there is only MEGAPACK template on themeforest.